A maximum of 35 teams may be entered either manually or via the File / Import Schedule command. After the current won/lost/ties entries have been updated, the Calculate / Division Standings menu command will update the division standings. An option exists to automatically update the Division Standings from the scores in the Schedule. If you are tracking your teams WLT results against other teams in the division, the Division Standings can be automatically updated from the Game Schedule. The method of tracking team records is flexible. The traditional method where the composite records of each team can be used. 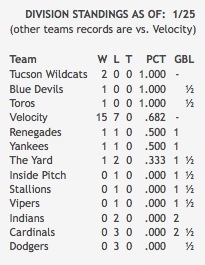 In the example above, the main team, Velocity, is a tournament team. The other teams are a composite list of all the teams that Velocity has played in the various tournaments. Thus, the records of the other teams are limited to the common games played. The SBC maintains the game schedule and results for all games. This includes attribute information (eg: Date, Time, Field), opponent, line scores and optional status. The schedule information can be imported from a file via the File / Import Schedule command or entered/modified manually via the Edit/Schedule command. 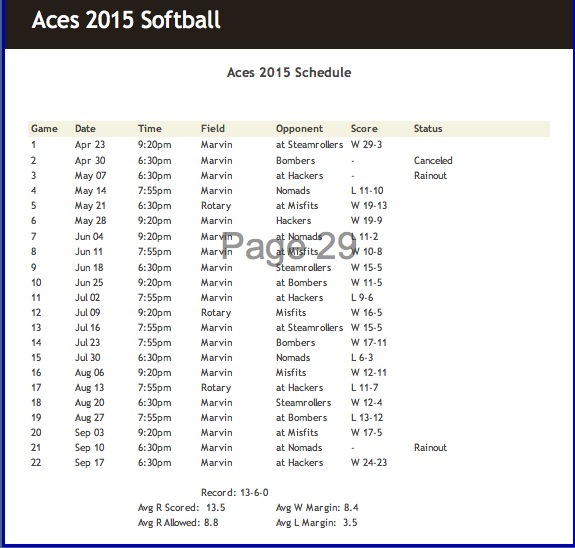 The schedule and results can be viewed at any time via the Display/Schedule command. Optionally, it can be printed and included as a web page. Game results are updated whenever the Line Score for a game is added/modified. A composite W/L/T record as well as runs scored and margins averages are displayed. The schedule information can be exported to a vCalendar (.ics) formatted file via the File / Export Schedule command. The file can be imported into popular calendar apps such as Google Calendar, Outlook, Andriod, iOS and OSX Calendar, etc. A basic Comma Separated Variables (.csv) formatted schedule can also be generated for calendar apps that cannot accept vCalendar formats. Although more limited in functionality, the .csv files are easier to edit or reformat. After individual player stats for a game have been entered, the Calculate / Batting Leaders menu command will calculate the top leaders from 19 user-selectable categories. Players from the expansion roster can be included if desired. The number of leaders displayed and the minimum AB or APP criteria are user selectable. Ties for the last position in each category will be computed and displayed. A quick summary of the top player in each category is also computed and displayed on the Team Summary Page. Ties for the first position in each category will be computed and displayed.